It's the electric car Chrysler and Fiat don't really want to make, but that isn't to say the 2013 Fiat 500e is a half-hearted attempt. On numbers alone, quite the opposite. Chrysler has announced the 500e's EPA efficiency figures, and both range and highway efficiency are class-leading. Official EPA highway mileage is 108 MPGe, making it the most efficient highway electric car on sale--ahead of both the 2013 Scion iQ EV and Honda Fit EV, both of which achieve 105 MPGe highway. That's no doubt helped by the 500e's enhanced aerodynamics, with drag reduced by 13 percent compared to the gasoline models. The 500e's city mileage is pegged at 122 MPGe, identical to the 2013 Smart Fortwo Electric Drive, and combined mileage is 116 MPGe, just behind the Fit EV's 118. Energy consumption is 29 kilowatt-hours per 100 miles. Official range is 87 miles, beating all similarly-sized EVs, as well as those from a few segments above, like the Nissan Leaf and Ford Focus Electric. Over 15,000 miles, the EPA estimates annual power costs of $500--identical to the Fit and iQ EVs. Those numbers will make the cute 500e a tempting proposition for some, particularly if the cheeky retro looks appeal. The car promises useful performance too, thanks to the 83 kW (111 horsepower) electric motor powering the front wheels. A full charge should take around 4 hours, with its on-board 240V Level 2 charger. Unfortunately, as one of a handful of "compliance cars" on sale in the U.S. market, the 500e will be sold in California alone. 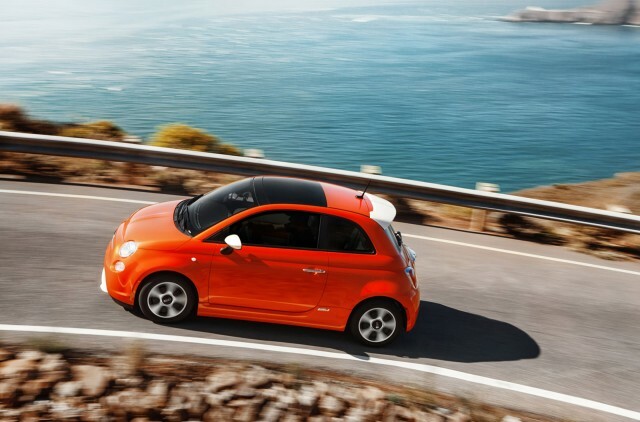 The first cars will arrive at Fiat Studios in second-quarter 2013. With every 500e Fiat sells losing the company $10K, Fiat is simply making the best of an uncomfortable situation.